We don’t generally elect to spend more time in the subway than is absolutely necessary. And who can blame us? Subway stations are usually dingy and dirty, be it merely garbage-strewn or completely rat-infested. But select transit hubs across the globe have made commuting not only tolerable but also enjoyable with their beautiful designs and innovations. 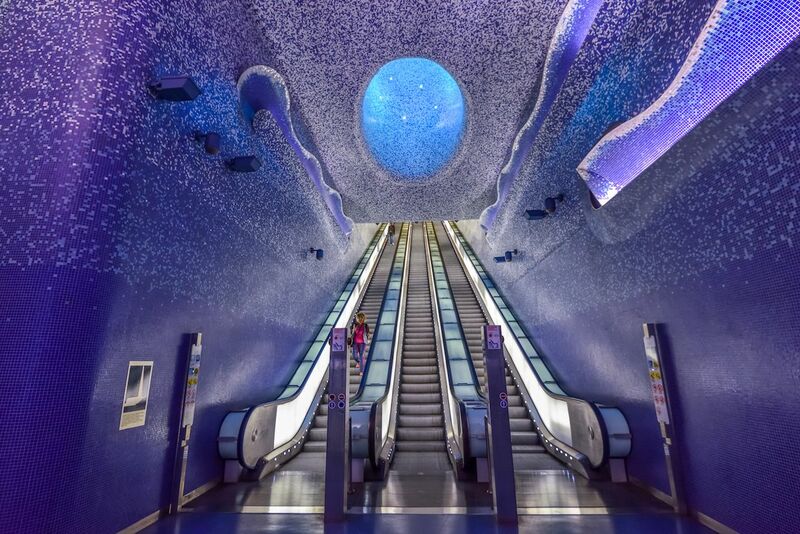 Here are seven of the coolest subway stations around the world with amazing architecture and design that are worth hopping off at whether or not they’re your actual stop. T-Centralen is the beating heart of Stockholm’s metro system. It’s where all three of the city’s metro lines converge and plays host to one of the most beautiful subway platforms in the world. 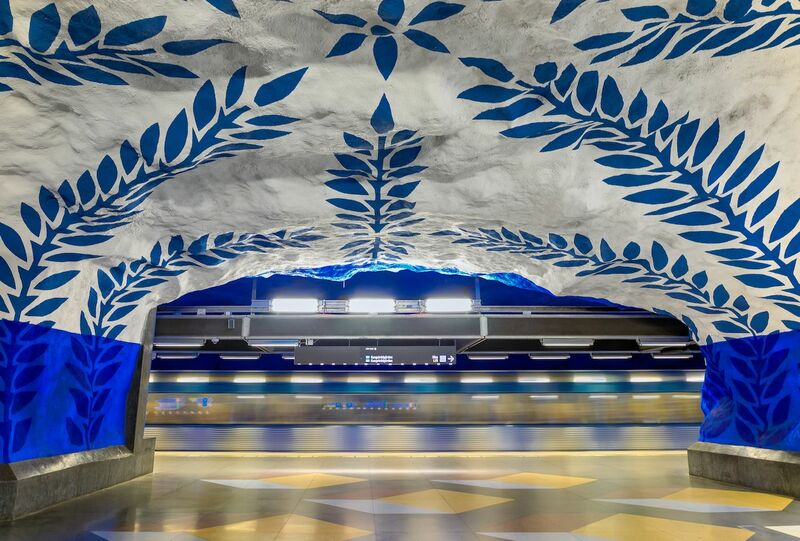 The blue-line platform is where you’ll find all the aesthetic action, honoring the line it services with bright blue details resembling Roman laurel wreaths against a white, cave-like backdrop. The color is thought to be not only pleasing to the eye but also soothing for commuters in the face of stress-inducing transit — at least according to art guide Marie Andersson. T-Centralen is not the only station in Stockholm worth seeing. 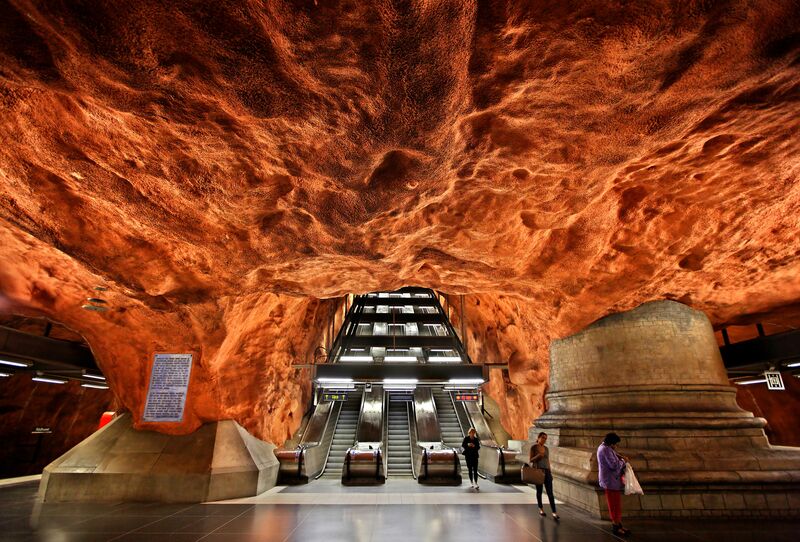 Another standout is Radhuset, which has a similar cave-like structure to T-Centralen but features a volcano-like, rust-red coloring. It’s easy to confuse Avtovo with St. Petersburg’s Marble Palace. 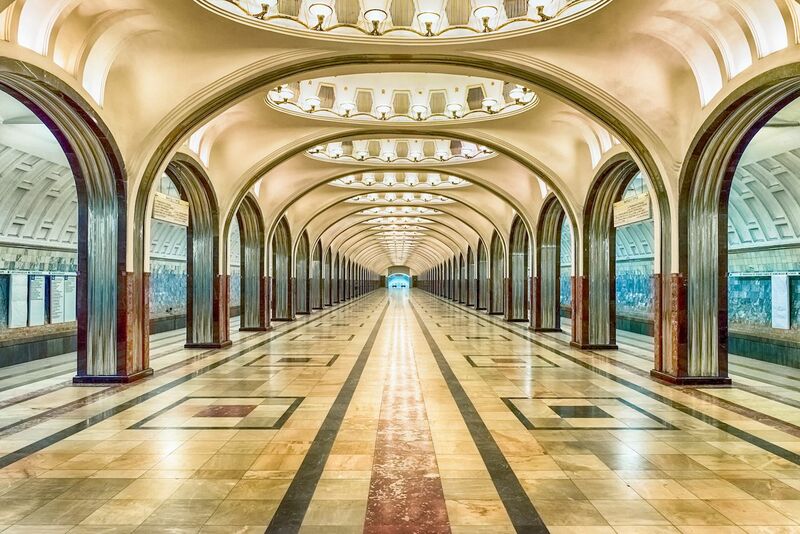 The vision of architect Yevgenii Levinson, it’s one of the most palatial metro stations ever designed. Passersby will find white-marble columns and walls, crystal chandeliers, and intricate mosaic work that pays homage to the Leningrad Blockade of WWII. The stately interior is what most people fawn over, but even Avtovo’s exterior is pretty majestic with its columns and cupola. If you plan on visiting, note that it can get pretty crowded during rush hour, so be sure hit the Kirovsko-Vyborgskaya Line station outside peak hours for optimal viewing. From a distance, the inside of the Toledo Metro station looks like it was glitter-bombed by an arts-and-crafts-happy kindergarten class, but the shimmery effect is actually the product of Bisazza glass mosaic tiling and LED lighting. The blue-purple color scheme is meant to evoke a seascape, making you feel like you’re traveling underwater rather than underground. The Toledo Metro station is one of several Art Stations in Naples and opens onto a famous shopping thoroughfare called Via Toledo. There’s a chance you’ll pass through en route to a souvenir-shopping spot, but if you’re not one for buying international trinkets, you can still appreciate this dazzling station for the roughly one euro it costs to ride the Naples Metro. 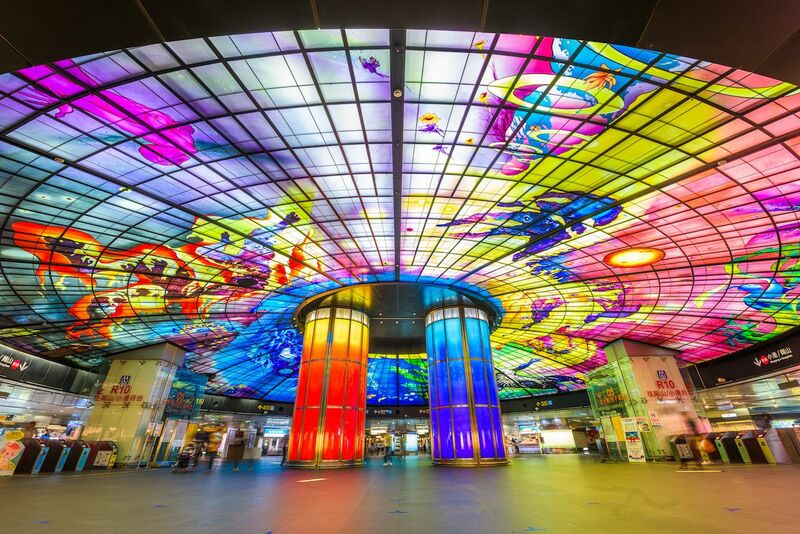 There are grand cathedrals the world over whose stained-glass windows don’t hold a candle to this station’s “Dome of Light,” said to be the largest colored-glass installation in the world. The dome is the work of renowned Italian artist Narcissus Quagliata, who shipped the piece to Taiwan all the way from Germany. It’s so breathtaking that the three-level metro station is a popular wedding venue. Whether you want to say your vows under the dome or simply stop by to marvel at it, you can find this spectacular station at the intersection of the MRT red and orange lines. Formerly known as the Khalid Bin Al Waleed Station, this cool-looking Red Line stop opened in 2009 and was later renamed for the BurJuman mall found just outside the station. 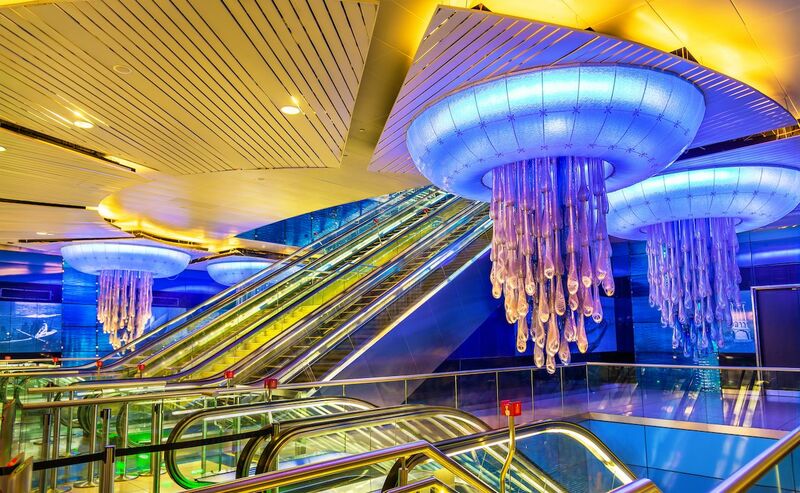 A nautical-themed transit hub, this particular station is famous for the bright blue, jellyfish-like lighting fixtures that hang from the ceiling (along with its reputation for being absolutely spotless). The work of Czech artist Jitka Kamencová Skuhravá, the funky fixtures get their otherworldly glow from a 150W projector, LED lights, and RGB-based optical fibers, which come together to make the deep-sea-inspired lights look amazing. 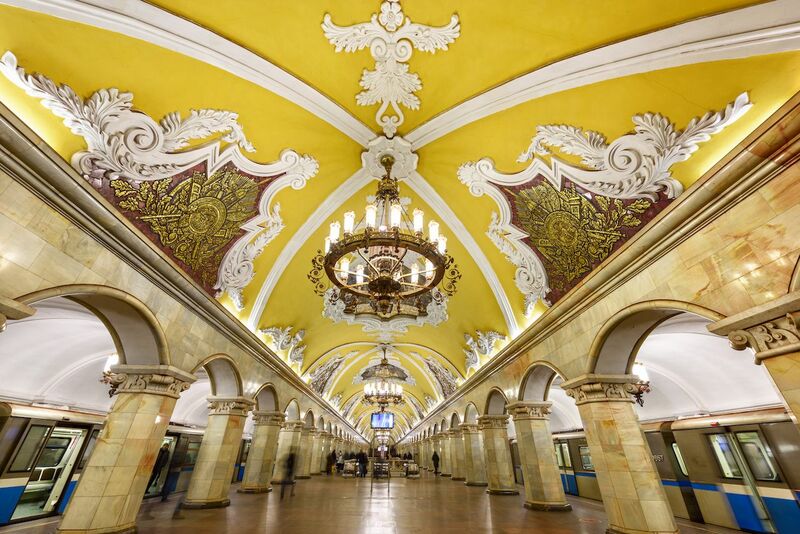 One of the busiest stations in the entire Moscow Metro system, canary-yellow Komsomolskaya is beautifully decorated with Corinthian columns, a Baroque ceiling, ornate chandeliers, friezes, and mosaics. An architectural marvel, it has even garnered awards for its design, including the grand prize at the 1958 Brussels World Fair. 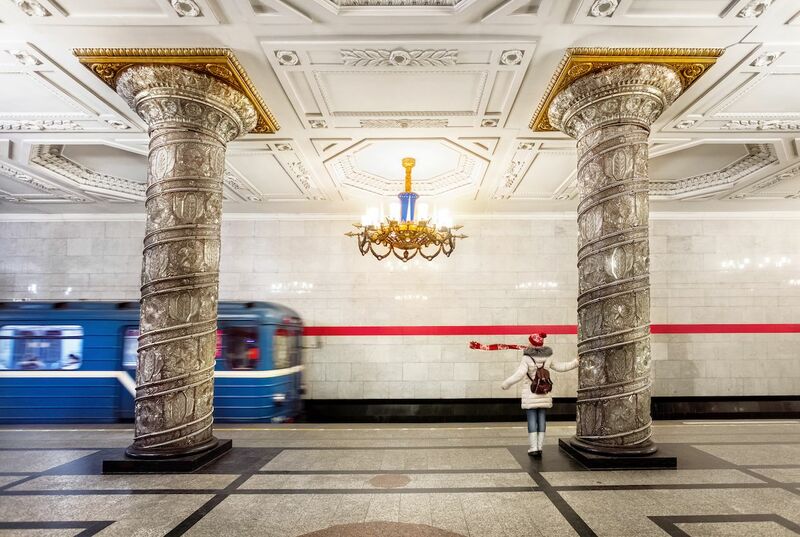 Komsomolskaya is in good company when it comes to stunning stops on the Moscow Metro. Equally impressive are the Mayakovskaya, Kiyevskaya, and Park Pobedy stations, all of which mirror architect Alexey Shchusev’s majestic vision for Komsomolskaya. There’s so much to see beneath the streets of Moscow that you could easily get swept up in the metro’s design elements and miss your train. 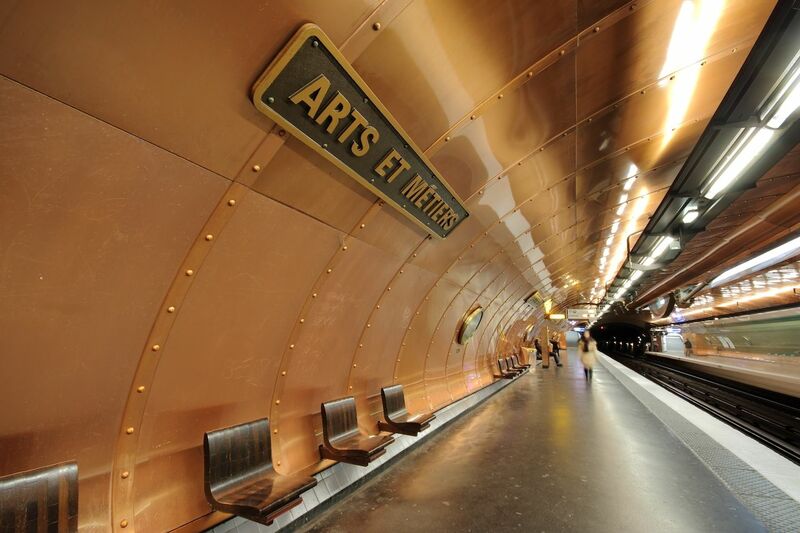 If you ever read 20,000 Leagues Under the Sea and wished you could have been aboard the Nautilus with Captain Nemo, put the Arts et Métiers subway station on your list of must-sees in Paris. Redesigned in 1994 by Belgian comic-book artist Francois Schuiten, this station has a distinctly steampunk-submarine aesthetic inspired by Jules Verne’s science-fiction classics. Schuiten plastered the station walls with riveted copper sheets and included fun decorative details like peepholes. Museum-worthy in its own right, the station also exits to the Musée des Arts et Métiers, or “Arts and Trade Museum,” which partnered with the RATP transit authority and Paris Métro to give the world a truly unique metro station.